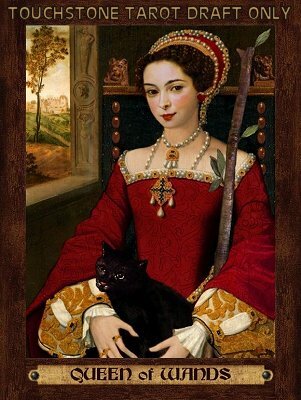 Touchstone Tarot is the second deck by Kat Black, author of the popular and critically acclaimed Golden Tarot. 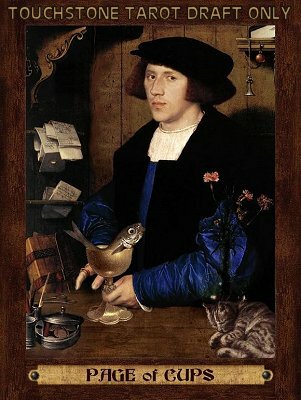 The artwork used in the deck is digitally collaged composites from the artwork of the European Renaissance and Baroque eras, with expressive and surprisingly modern looking faces to communicate the meanings of each card. Touchstone Tarot was published by Kunati who unfortunately closed due to the global economic crisis in September 2009. 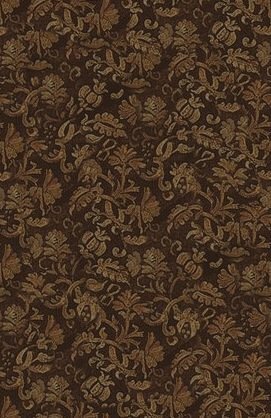 It comes as a luxury, gilt-edged deck with a small companion book and a sturdy hinged box to store them in. It is available at Tarot Connection and Tarot Garden, and will continue to be available for some time despite the publisher's closing their doors. You can join the Touchstone Tarot Facebook Page and/or the Aeclectic Tarot Thread to keep up to date with all the goings-on. In addition to the Kunati release of Touchstone, there was a limited edition for Collectors published by Leisa ReFalo at TarotConnection.net - which went on sale 1st August 2008 and quickly sold out. Meanings: Look within. A time for reflection, quietness and solitude. Stand apart from your everyday life to assess your goals. You will find the answers you seek there. Reversed: A lonely recluse. Isolation, lack of necessary social skills. Inability to empathize or compromise. Edit notes: One of my mentors mentioned that the animals (and his rapture) make him seem not as alone as this card usually indicates. 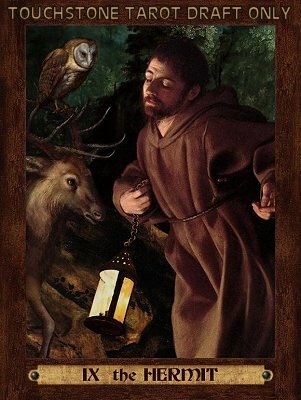 I know my association of the Hermit with Francis of Assisi (as per Golden) isn't very traditional, but it's how I've always felt about this card. ie, it means drawing away from human company, but not necessarily non-human company. Closer to nature, closer to God (or spirit, or whatever you call that force). (note: the real deck does not have the name 'Touchstone Tarot' on the card). Meanings: The star. This woman is a flame that draws others in. She is confident, passionate and sensual. She laughs easily and lights up a room with her vivid personality, but she can be exhausting. Reversed: The advocate. A woman who takes action on behalf of others. She loves a cause and is passionately interested… until she isn’t. She has a very short attention span, don’t rely on her for the long haul. Edit notes: I have used the body of a young Queen Elizabeth I, and a Baroque-era face that reminded me of Queen Elizabeth II (current Queen of the United Kingdom) circa her coronation. 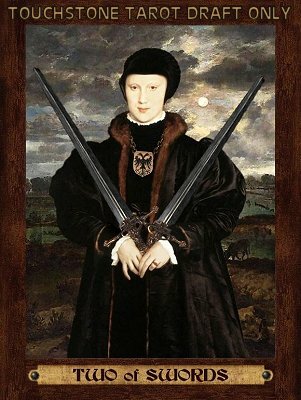 I feel they both started out as Queens of Wands, but the weight of their responsiblities later made them more Queens of Swords. So, in a way, this is my tribute to them both as young, passionate idealists (and hotties!). I have used venetian red as the colour for the suit of Wands. Meanings: Practice makes perfect. Skills mastered by repetition. Success is ten percent inspiration and ninety percent perspiration – keep at it and one day you will be a master at your craft. Reversed: The impatient apprentice. No skill worth learning can be mastered overnight. Natural ability and talent will only get you so far, tools take time to become part of your hand. Edit notes: I'm fascinated by the tools here. A cartographer or engineer perhaps? Being a bit of a compulsive workaholic, I love the Eight of Coins. 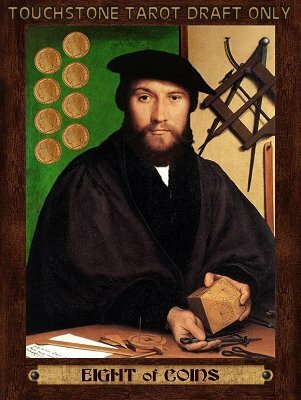 I have used forest green as the colour for the suit of Coins. Meanings: A truce. Resolution of conflict, willingness to negotiate and compromise. Political savvy. Effective defence. A rival drives you to improve your skills and strategy, then mutual respect results. Reversed: Dropping one’s guard. Indecision, lack of concord, disputes arising. Take care to avoid unnecessary conflict and people who enjoy creating trouble. Unlike RWS, she is not blindfolded - I am NOT covering up those lovely eyes, and also I think that all choices need to be made with eyes wide open. I have used black and gold as the colours for the suit of Swords. Meanings: The dreamer. A warm, loving and romantic youth, one fragile and easily hurt. Messages about emotions – eg, love letters. Reversed: A hopeless romantic. One who does not value reality and is happy to become lost in their own fantasy world, oblivious to the fact that their affections might not be reciprocated. All of my Pages are students, in black cap and gown - a common format for portraiture of the era. My little, fluffy cat Ellie sleeps beside me as I work. She's not grey, but she's just as sweet. I have used ultramarine (blue) as the colour for the suit of Cups.